Review portals allow external judges to review applications and, optionally, submit answers that include both objective scoring and subjective comments. From Workspace Settings, choose the Portals plugin. If this is your first time setting up a portal, then you will need to authorize the portal ( Learn More). Click the green button in the top right, " Create Portal." Warning! 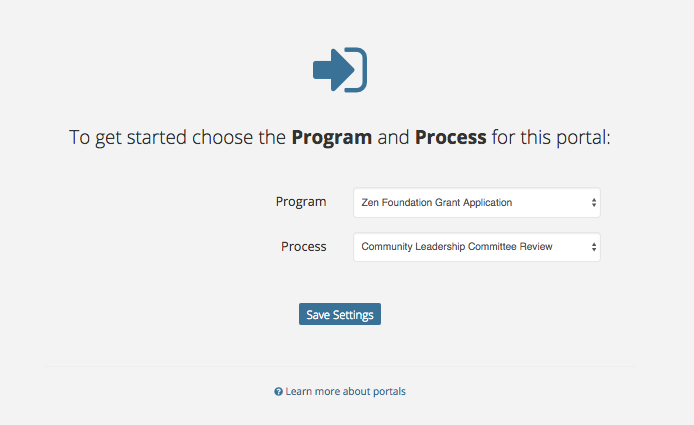 Before setting up a feedback portal, you will need to setup a Process in the Program Manager. Choose the appropriate program and process to begin. Once you press "Save Settings" you will be brought to a page with four tabs of configurations for your portal: General Settings, Access, Data, and Feedback (if configured). URL The URL is the link that is published externally. Use only lowercase letters, numbers, dashes, or underscores. Go to Portal: Opens the portal in another browser tab for testing. Copy Portal URL: Allows you to copy the URL for pasting into communications for your portal users. Copy iframe code: Allows you to copy the iframe code for embedding into your website. Active The Active flag indicates whether or not the portal is open for feedback. If someone goes to the URL while the portal is inactive, they can log in, but cannot submit feedback. Logo You may choose to upload a logo that will brand the portal. We recommend this if you will be sharing the URL directly with your portal users. Do not choose this option if you will be embedding the form on your our (or company) website. Access refers to who the portal users are and what their login experience should be. The following settings apply to private portals ( Public portals do not have additional access settings). Member Email Field The email field within the Portal Users form that stores their login credentials. Default Password (Legacy) This process is changing in an upcoming release wherein portal users will set their own passwords when they log into a portal for the first time. Read more here. Login Text Customize text that the portal users can read prior to signing up or logging in. We recommend introducing the process, as well as highlighting deadlines or special instructions. 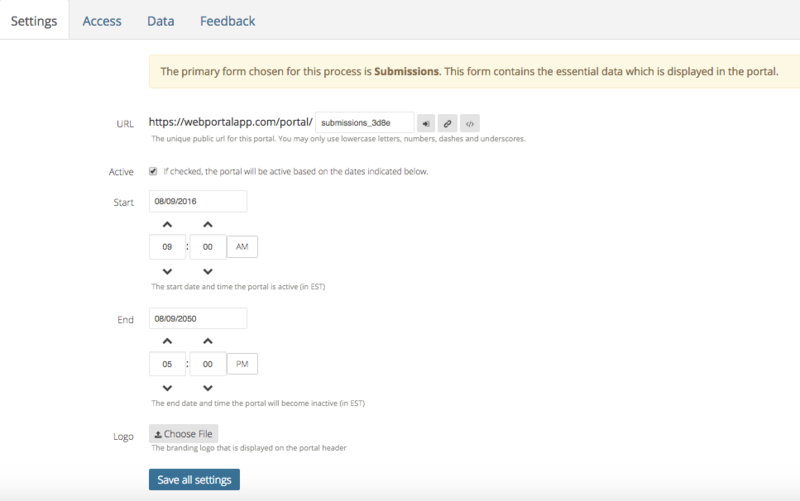 Data settings indicate how you want to present the submissions and review forms to the portal user. The Data tab has four sub-tabs with different configurations: Listing Style, Listing Pages, Data Detail, and Other. Upon logging in, portal users see a listing of submissions. These settings define what that screen looks like. Style Choose between listing or grid style. Grid is typically only used if presenting an image to represent the submission. Display Button Choose whether or not to display a button to the submission details. Items Up to three items per listing can be displayed to the user. This can include a combination of fields and a button. Grids can also include an image. Click on an item to further configure it. Button: Configure the wording used to represent the user's status for Not Started and Completed feedback. At this time, you cannot configure the wording to represent feedback saved as a draft; the portal automatically uses the wording "In Progress"
Field: Configure the field to display to the user. You can also choose whether to display this field as a link to the submission (which will function the same as a button would), and whether to display the field label. Image: Choose a file upload field. Note that if a particular submission does not contain an image or document that has been converted, no image will be shown to the portal user for that submission. By default, portals contain a single listing page. Additional listing pages can be optionally added to organize submissions for the portal users. They can be presented as tabs, which is recommended for a small number of listing pages, or as a dropdown. Page Name Provide a short, descriptive page name. Folders Choose which folders should be shared with the portal user. Sort By Choose whether to sort by name or date (oldest first). Entries per Page Determine how many submissions are displayed per page. If the number of submissions exceeds this number then paging controls will appear to the portal user at the bottom of the page. Hover Tip Provides a mouse over 'tip' that can provide additional details. Here you can control which data is displayed. 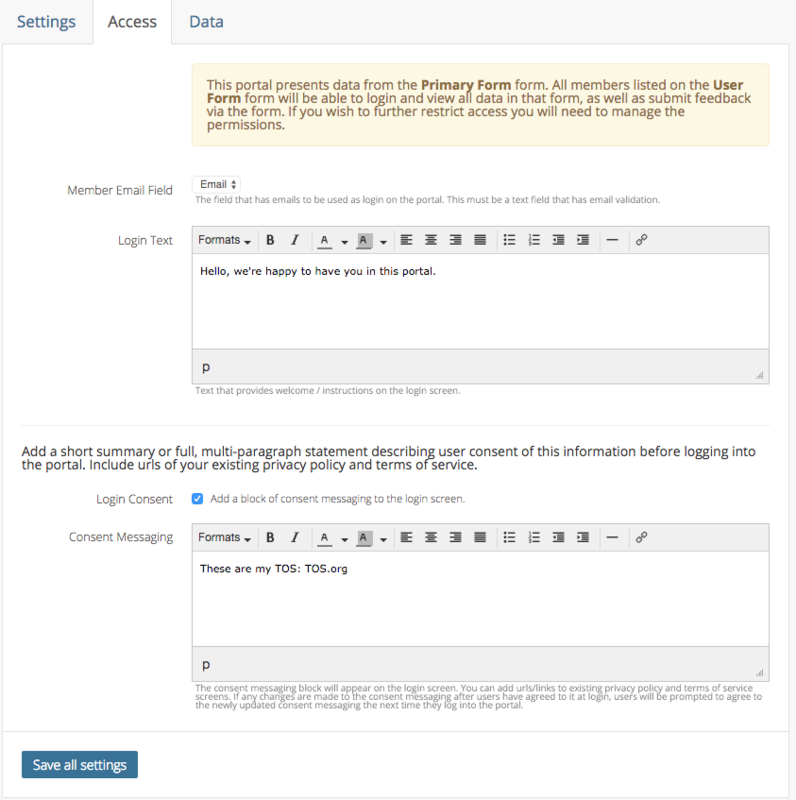 Administrators can choose to display data from multiple forms connected to the main form; for example, recommendation letters or previous reviews. You can also opt to include forms that link to other forms in a child-to-parent relationship. On the left-hand side of this page, you will see a summary of your workspace and the available forms that you can bring into your portal. They will be colored either blue (for the primary form); purple (for parent forms); or green (for child forms). In the following screenshot, you can see that Submissions is the primary form; Reviews, Awards, and Recommendation are child forms; and Applicants is the parent form, that is linked to from at least one of the child forms. On the right-hand side, you will see the forms that you have dragged into your portal and are thus displayed in your portal. 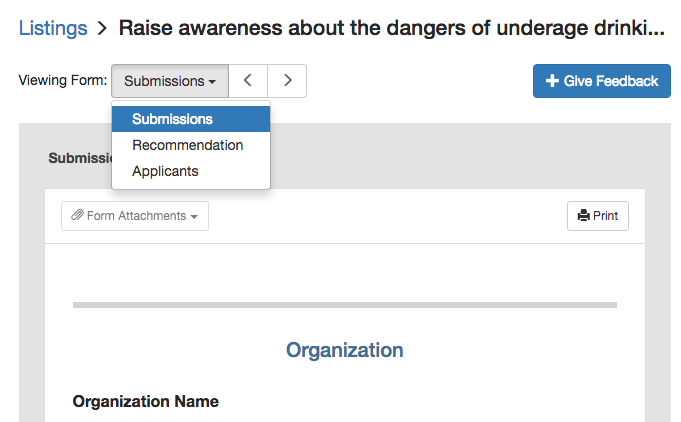 In the example above, just the primary Submissions form is displayed. Let's imagine I also want a review to look at the recommendation forms submitted on behalf of this submission, as well as demographic information about the applicant, housed in the Applicants form. I can drag and drop both of those to the Portal Form List to display them in the portal. You can put up to 20 forms in a portal. When you Save Settings, you will see in the portal that the forms are now listed in the order you have set. To take this a step further, you can configure what each particular form looks like in the portal. To do this, click the settings icon next to the name of the form you wish to configure. You can rename a form by clicking the pen and paper icon next to the form name at the top. You can also set which fields from that form will be shown in the portal. A black check indicates the field will be shown, while a gray check indicates the field will not. Use the drag and drop to reorder the fields as you see fit. Use the Labels column to rename or re-label the fields as they are shown in the portal. Help Text for Portal Users can be customized. You have the option to: reorder the fields by dragging and dropping; add help text to the field; and set the field to be an input field, hidden, or view-only (or non-editable). Feedback Button Text The add Feedback button text in the portal can be customized. For example, you might want to change this wording to "Add Review." Allow Resubmit Enable resubmit for your feedback form for portal users. See more details below. Field Details You have the option to: reorder the fields by dragging and dropping; add help text to the field; and set the field to be an input field, hidden, or view-only (or non-editable). 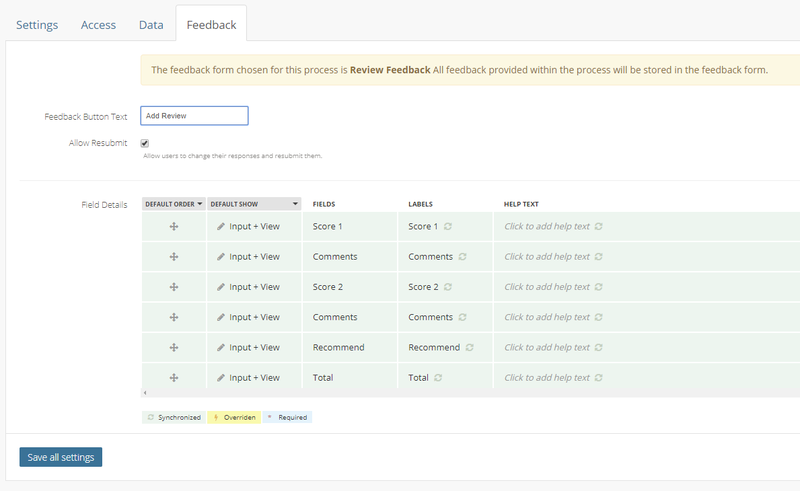 These settings will impact how the feedback form displays in the review portal for the reviewer (portal user) to interact. If adding a linked form field type to display to portal users, when added, these fields will be hidden by default. You will have to use this tab to show them if that is the desired result. 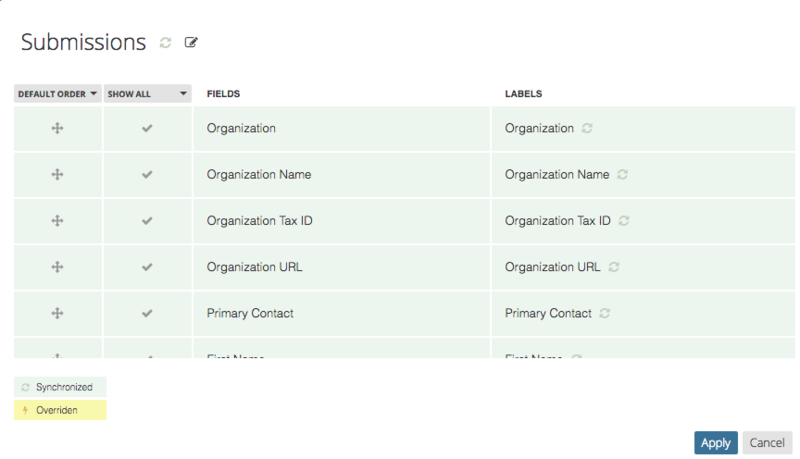 This does not include the linked primary form and linked portal users form, those two linked fields will always be hidden and not appear in the above details section. You can opt whether you would like to give reviewers the option to edit an already submitted review and resubmit it. By checking off 'Allow Resubmit,' reviewers can edit a review as many times as they would like post-submission. By unchecking, reviewers will not have the option to change a review once submitted. Note that the Resubmit function is turned off by default. If you would like your reviewers to have this capability, you will need to enter Settings and turn it on. When feedback is turned on in the review portal, your reviewers have the option to filter the entries assigned to them by Not Started, In Progress, and Done. What types of video files can be played within the Portal?